If you’re looking to start a goat farming business in Bangladesh then you must collect the best goat breeds for your farm. And when we talk about goat farming, it’s getting more popular gradually. Although it’s an established business, many producers are thinking about establishing a commercial goat farming business. Not only is the domestic demand for goat milk and meat but there a huge demand in international markets as well. That’s why commercial goat farming under intensive or semi-intensive system has been gaining momentum for the past few years due to its high demand and good economic prospects. Moreover, in order to take up the goat enterprise on a commercial scale, commercial goat farming has been deriving many modern farmers, professionals, ex-serviceman, unemployed educated youths and famous businessman. As goat milk is known for having less lactose than other types of milk, it’s easier to digest for people who suffer from Lactose Intolerance. The demand for goat milk is higher than ever for this and many other reasons. Also, there are many people those who love good goat cheese in a salad or on a sandwich. So, goats must be able to produce a lot of milk when looking for a good goat for producing milk. Moreover, with the potential for good economic returns of their total initial investment, there is a high demand for goat and all goat products. This is because the producers are being interested more by the emerging favorable market conditions and easy accessibility of improved goat farming technologies. These all are available when you’ll use the best goat breeds for commercial use. Goats are the most common animal added to a small or urban homestead next to the chickens. Also, there are some other positive things like goats are among the main meat and milk producing animals etc. depending on the breed you choose, they have the ability to provide you with milk, meat, and fiber. Goats are not only one of the most popular animals for milk and meat production but these cute, friendly animals are much easier to raise than cows, making them the best animal to raise for a commercial, small-scale farmer or homesteader. But, there are different types of best goat breeds just like cats and dogs and every breed has different meat and milk production rate. So, you need to raise the right breed in the first place if you want to get the most out of your goat. 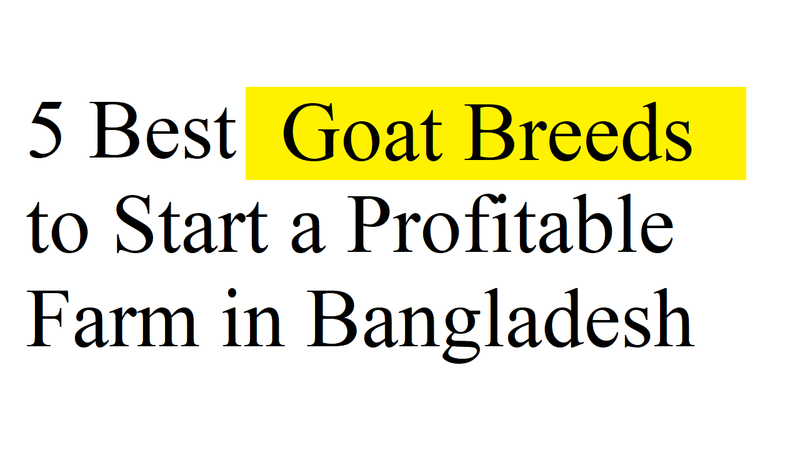 Well, let’s know about the top 5 best goat breeds so that you can start a profitable farm in Bangladesh. As Boers are best for meat, the males can grow to be 300 pounds. So, they are one of the most popular breeds for meat production, because of this large size. Among other benefits of this one of the best goat breeds that they are resistant to disease and reproduce often. And Australia uses Boer goats to do this and they are the top exporter of goat meat. They originally derive from South Africa in the early 1900s while they are popular in Australia. That’s why if you’re looking for the best goat breeds for meat purpose then you have only one option to choose Boers. You’ll find 25 million Black Bengal goats in Bangladesh where people with Black Bengal find a way to support themselves with its milk and meat. It’s a good option for the people as these goats are relatively easy to care for, house, and feed. They can even feed on natural sources if you have a safe place by a food source. Also, they are the best goat breeds themselves as they can give birth to 2 – 3 kids twice a year. And as a good breeder, Black Bengal starts reproducing at about 15 months old. Besides, the farmers use everything that they can from the goat with Bangladesh being a less affluent country. Apart from these, this type of goats can produce 25 pounds of meat at a time and their coat can weigh 44 pounds. That’s why, as it does not produce milk well, meat and coat are the most important products from this animal. Known as fainting goats, Myotonic goats are known for their unusual reaction when under distress: freezing for a couple second and “fainting”, which is developed from a genetic disorder. Once upon a time, they used to primarily to get goat meat. Although they do not produce angora, they do grow coats that make great cashmere items. And it can grow to about 25 inches tall and weigh 174 pounds that’s good for commercial production. This is not only one of the smaller and best goat breeds of meat but they also have distinct eyes that pop out of their head. But, because of the fainting problem, these goats are not generally used to breed with other goats. The most attractive thing about Kalahari, also known as the Kalahari Red, is its meat is tendered than other breeds. And because they are durable, these goats are good to breed. Also, they are well durable against the common diseases and parasites in the area. And they can be bred with larger breeds in order to make them meatier.